More Cocktail Science: Why Do My Shaker Cans Get Sucked Together? You’ve no doubt noticed that when you properly shake an alcoholic drink, the parts of your shaker are drawn tightly together by an internal vacuum force. Why does this happen and how big is the force? A couple of cool things are happening when you shake. First, the air that’s in your shaker starts off at room temperature. As you are shaking, this air gets cooled just like your drink does. Cooling the air causes the pressure to go down, which causes a vacuum. That isn’t all that’s happening, though. Ice is less dense than water. When ice melts, it actually contracts in volume. When the volume of liquid plus ice in the shaker contracts, the volume of air in the shaker increases. Since you aren’t adding more air molecules, increasing the volume decreases pressure, causing more vacuum. Third, as your liquor gets colder, its density increases, again shrinking in volume and creating more vacuum. A third factor may be a small amount of expelled air when the bartender slams down on the cans before the shake. The last effect is hard to calculate mathematically. Those are the conclusions. Here are the gory details. The internal closed volume of my 28-16 ounce shaker can setup is 842 ml. Let’s say we start with a standard pour of 100 ml of 80 proof vodka at 25ºC and add 172 grams of 0ºC ice to it. Ice at 0ºC has a density of 0.9167 grams/ml, so our ice volume is 188 ml. Therefore before we shake, the volume of gas in our shakers is 842 ml – (100 ml booze + 188 ml ice) = 554 ml. Let’s assume that the air inside the shaker starts at atmospheric pressure (1013 mbar or 1 atm) and is also at 25ºC. Let’s also assume that no air or liquid escapes while we shake (not such a great assumption, but oh well). Finally, let’s assume that during the course of a 13.5 second shake, the temperature of the drink (and also the air) goes down to -5.7ºC and 63 grams of ice was melted. I chose these numbers because I have good temperature and ice weight data for a shake exactly like that. See here. Now we have to figure out the pressure of the gas inside our shakers after the shake. Well, the ideal gas law (remember high school!) says that (pressure) x (volume) = (number of molecules) x (an arbitrary constant that depends on units, called the gas constant) x (temperature). The shorthand is PV=nRT. At the beginning we know the pressure (1 atm or 14.7 psi—pounds per square inch), the volume (554ml), the gas constant (a crazy number because I am not using standard units), and the temperature (25ºC or 298.15ºK). Now we can figure out how many gas molecules we have. Turns out we have 0.136 x 10^23 molecules of gas (aka .0227 moles). We are almost done. We are trying to find the final pressure so we need all the other values. We know the new temp (-5.7ºC), the number of molecules stays the same as does the gas constant. All we need is the volume. After calculating the density change of melting ice and the density change of the cooling drink (the density change of cooling ice isn’t so important), the new liquid drink plus ice volume is 280 ml –8 ml less than before. Consequently our gas volume is 8 ml larger than before. Plug in all the numbers, and the inside of the shaker has a negative pressure of about 1.7 psi. Since the small shaker measures 3 3⁄16 inches across, the force to pull the cans apart should be about 13.6 pounds. Not bad. Does this fit what actually happens? 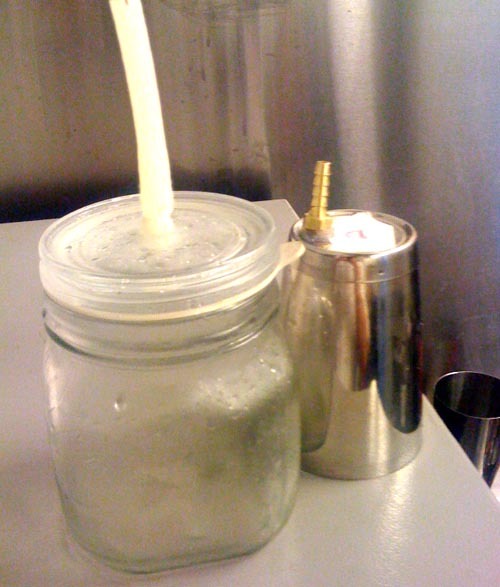 Mason jar standing in for a shaker. I couldn't wait for the small shaker on right to dry (too impatient). Well, I have some canning jars that hold almost exactly the same volume as my shakers (they are within 10 ml). Luckily, for me, these jars seal well and already have a 1⁄4-inch hose barb glued to them that fits the hose of my vacuum gauge perfectly. We shook 100 ml of 80 proof vodka with 172 grams of ice and, after 15 seconds, reached a negative pressure of 1.37 psi. Pretty close. I was happy enough. Don’t hesitate to call me out if you see any errors. Obvious solution: shakers with intake valves! I saw a shaker that had a hinged lid on top, I think it was designed to provide leverage to break the seal easily. What is the vapor pressure of 25ºC vodka? Cooling will result in condensation of gaseous ethanol and water. Would this contribution be of a magnitude to make a difference? Dunno. I could look it up. I guess I was assuming it all happened so fast that there was no time for an equilibrium vapor phase of vodka to form. I don’t think it would make that much difference. I could be wrong. At least, such condensation is supposedly the main reason for jam and preserves lids being sucked in. But that’s of course boiling hot water solutions. What’s the best place to buy shaker cans in New York? On Bowery I can find the big one but not the little one. I bought one at Zabar’s (80th & B’way). No frills, works fine. Also worth considering: The solubility of air in water increases as temperature decreases. By shaking you’re giving plenty of opportunity for more air to dissolve in the liquid. You start out with 0 degree ice, and room temperature drinks, but end up with drink and air at negative temperature? How could that be? shouldn’t they equalize at a temperature somewhere in between? Why do I think you’re abusing the term vacuum? Decreased pressure isn’t vacuum! I guess that is fair. I guess. Gauge pressure is the difference between a measured pressure and the surrounding atmosphere. Negative gauge pressure is referred to as vacuum. It is not possible to get to negative absolute pressure. In this case, you have a reduction in absolute pressure from 14.7 psi to 13.33 psi. This is 1.37 psi of vacuum. I tried this but it didn’t work. I think I missed something along the process. Thanks for the post. Will retry. Your cans didn’t get sucked together? Did you have a good seal?